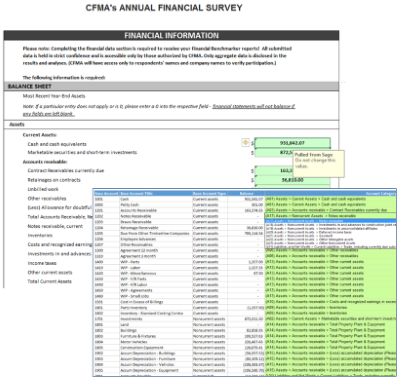 CFMA Benchmarker Template - Event 1 Software, Inc.
Save time completing the CFMA Benchmarker survey worksheet by allowing Sage Office Connector to automatically populate financial values directly from your accounting system. Watch a short 3-minute video about this solution. Have questions? Click here to check out our frequently-asked-questions page. Note - You will need to enter your company name and any of your valid Office Connector license IDs to download this template. Click here for details. Don't own Office Connector yet? Click here to get information about Office Connector licenses and to contact Sage. Licenses can also be ordered from your Sage Business Partner. Office Connector is an add-in to Microsoft Excel that integrates Sage 300 Construction and Real Estate with Excel. Use it to build reports in Excel that can be refreshed with a click of a button and also use it to send data from Excel into Sage 300 CRE. With the financials add-on, special financial functions become available in Excel that allow you to create a full range of financial reporting solutions with ease. Watch a 1-minute video about Office Connector Financials. Watch a 7-minute video that takes a deeper dive into how Office Connector Financials works and how you can build your own financial statements in Excel. Click the Add-ins tab on the ribbon. In the Menu Commands group, click the Office Connectordrop-down menu. Click the Help menu and then Licensing. Your company name (as it is stored in our system) and your Office Connector license IDs will be displayed. License IDs are shown as a string of 26 letters and numbers in groupings of five or six. Any valid Office Connector license ID may be used to download the template. You may copy and paste these values into the download page.